Dead Night – Entertainment Ave! Alas, there is weirdness in them thar woods. The weirdness begins with someone watching a TV in the woods, playing an episode of “Inside Crime,” a news show similar to the likes of “Dateline” or “20/20.” We see that this episode is about “Axe Mom,” who turns out to be Casey, and the film shifts between TV show clips, and what is happening in real life. Suddenly there is a lot more going on in “Dead Night” as two women show up in the woods with some kind of agenda, dad finds a woman’s body, Leslie Bison (Barbara Crampton), in the woods, and Leslie, after being resuscitated, seems perfectly fine physically, but mentally she is a weirdo. Horror films aren’t always supposed to make a lot of sense, and “Dead Night” plays perfectly into that realm. What they are supposed to do, though, through the wackiness, is entertain or make you frightened. I will say that I wasn’t that frightened, mostly because it takes a lot for a horror film to frighten me, but the movie did keep me entertained. It also did a great job of not letting my mind wander into “checking phone land” as, with so much going on in the movie, between the switching to the “Inside Crime,” to new characters, to blood splatter, I realized I actually needed to pay attention to how everything would come together. Nice job, movie folks! In the end I would pop “Dead Night” at 4 stars out of 5. Some nice twists aren’t ruined with blatant foreshadowing, the story comes together at the end, and the transformation of Becky into who-knows-what is glorious. 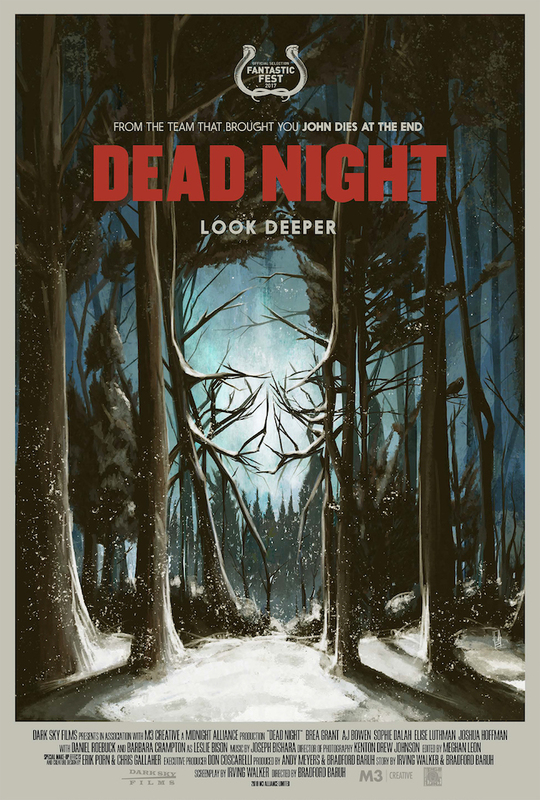 Enjoy the beheadings, enjoy the weirdness, and enjoy “Dead Night” for a tidy, little horror film that doesn’t add a lot of filler to the story just to add time.